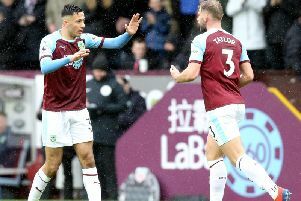 Clarets boss Sean Dyche felt his side were deserved winners as they stunned champions Chelsea on the opening day of the Premier League season. Sam Vokes scored twice, continuing the superb form he finished last season in, while Stephen Ward netted a stunning half volley as Burnley went in 3-0 up at half-time, capitalising on the early dismissal of former Claret Gary Cahill. Chelsea pulled two goals back after the break, as £70m man Alvaro Morata came on for his debut to score one and make one, either side of Cesc Fabregas following Cahill down the tunnel for two yellow cards. Burnley held on, and Dyche said: “Overall (we deserved it), they're a top class side, with fantastic individuals, and 3-0 down is not usual for them. “They had to respond, which they did, so credit to them, but we were disappointed with the two goals. “Before that, we’d kept a good shape and I don't think they opened us up or made too many chances. “But it's a big win, they're a fine side, even with 10 men. “They opened up the pitch even more with 10 men, which put us on the back foot a little in the second half, but that's to be expected. Asked whether he sensed the champions were vulnerable without Eden Hazard, Diego Costa, Pedro and Tiemoue Bakayoko, he added: “I don't think so. We kept a good shape early in the game, but the sending off makes a big difference. “I haven't seen it but my staff said it was a correct decision. “The referee was good, he had a really tough game but handled it well overall. “But that obviously changes it. That said, how do you respond to It? And we responded very well. “We didn't lose out shape, we did the basics well, kept it simple, kept the ball simply, created enough chances and took them. “Second half, do we keep going or try to contain? We tried to contain - not easy. Antonio Conte described Burnley as “rough” in a backhanded compliment before the game, but Burnley have more finesse about them, with Steven Defour backed by Jack Cork in the centre of midfield, and Dyche said: “We've got to learn to keep possession better, we’re still flippant with it, and some of that is the talent base, and increasing the talent base from within, some is the assuredness that comes with these top players. Mine are still growing and improving with that. “First half better, second half not as well, but they're a good side - their physicality, they're a strong side, they press high, fast, and it can put you off kilter. Burnley had to wait until their penultimate away game to win on the road last season, and Dyche smiled: “Three years ago, it was a story getting a win, the away win was a story last year, and it kills all that off. “But we’re not getting carried away, it's a great result, brilliant for our players and supporters, but we know there's a big season ahead of us, and everyone is telling us it's a big challenge. “We keep moving it forward, now can we move it forward again?